Nominations for the KiwiRail Industrial Councils closed on Friday 21 July 2017 at 5pm and the results are as follows. Following the recent NMC election, John Keenan will fill the Locomotive Central position and Mike Williams the Locomotive Southern position. Locomotive Northern – Tim Kerwin elected unopposed. Upper North Island Terminals – Dean Ngatai elected unopposed. South Island Terminals – Marty Duncan elected unopposed. C T Site – Iain Hutchinson elected unopposed. Lower North Island Terminals – A ballot will be held between Siaosi Tauvae and Michael Vowles. We anticipate issuing ballot papers to members in the Lower North Island Terminals designation during the week ending 28 July 2017. Congratulations to those successful nominees, Organiser Todd Valster will be in contact to advise you of the next meeting and the current matters being addressed by the Council. KIWIRAIL INTERISLANDER INDUSTRIAL COUNCIL There are no Interislander Representatives on the NMC and therefore all positions on the council were open for nominations. Scale 1 (Inside Wellington Terminal) – Annelies Griemink elected unopposed. Scale 1 (Inside Picton Terminal) – Tania Haraki elected unopposed. Ferry Operations (Wellington Outside Terminal) - John Finch elected unopposed. Ferry Operations (Picton Outside Terminal) - Vern Steele elected unopposed. Congratulations to those successful nominees, Wayne Butson will be in contact to advise you of the next meeting and the current matters being addressed by the Council. There are no Mechanical Representatives on the NMC and therefore all positions on the council were open for nominations. Train Examiner Maintenance – Shane McNae elected unopposed. Hutt Workshops – Mathew Cordell-Bain elected unopposed. Servicing Mechanical – Logan Kahui elected unopposed. North Island Depots – John Evans elected unopposed. South Island Depots – Luke James elected unopposed. There are no I&A Representatives on the NMC and therefore all positions on the council were open for nominations. Infrastructure Bridges & Structures – no candidate nominated. Infrastructure Mechanical – Jerry Hohepa elected unopposed. Infrastructure Track Supervisors – Kevin Gubb elected unopposed. Operations Scale 1 – no candidate nominated. Operations Train Control – Michael Graham elected unopposed Infrastructure Trackworker – Brad Claridge elected unopposed Infrastructure Sigs, Comms, Traction – no candidate nominated. Congratulations to those successful nominees, Organiser John Kerr will be in contact to advise you of the next meeting and the current matters being addressed by the Council. 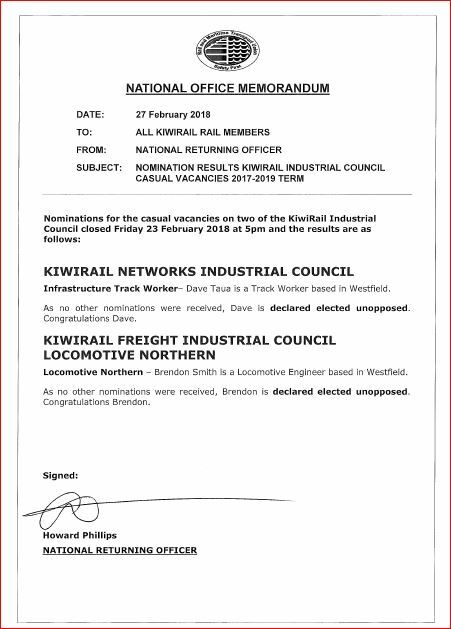 NOMINATIONS ARE RECALLED FOR KIWIRAIL I&A INDUSTRIAL COUNCIL Infrastructure Bridges & Structures – currently vacant. If you are employed within the Bridge or Structures gangs specialised area of KiwiRail I & A then you are eligible for nomination to this position. Operations Scale 1 – currently vacant. If you are paid under payscale 1 of the MECA and employed within the clerical, administration, codes and standards and technical areas of KiwiRail I & A then you are eligible for nomination to this position. Infrastructure Sigs, Comms, Traction – currently vacant. If you are employed within the Signals, Communications, Traction specialised areas of KiwiRail I & A then you are eligible for nomination to this position. Correctly completed nomination forms must be received by the National Returning Officer at the National Office of the Rail & Maritime Transport Union, PO Box 1103 Wellington 6140 no later than 1700 hrs. on Friday 18th August 2017. In the event that there is more than one nomination for any position, a postal ballot shall be run. Nominees must have their photo and a short promotional statement of up to 250 words to the National Office no later than 1700 hrs on Friday 25 August 2017. Electronic receipt of this information is preferred. Please ensure you advise National Office if you have changed addresses or your designation in the Company since the last RMTU mail-out. Call RMTU 04-4992066 or alternatively update your details online www.rmtunion.org.nz or email admin@rmtunion.org.nz.